Wifi Display Dongle is a special device to project your mobile phone/MID/Notebook to another big screen through WIFI connection, under the popular standards like DLNA, Miracast and Airplay. Support IOS Device(iphone ipad ipod mac), Android Smartphone 4.4 and above, Windows8.1 and 10. We are responsible for any loss from our customers. If this item cannot work properly, please contact us for a replacement or getting full refund after return. 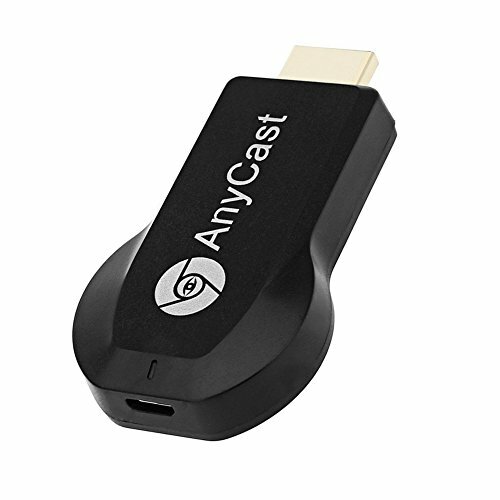 Attention:1.The Anycast dongle must be powered by 5V/1A power adapter. 2.Not Compatible with Google Home APP,Netflix,HBO go, HULU and Honda motor and other encrypted videos and APP. 3.Android device must supports MiraCast(if not,it not works). Mirror Function - Project and mirror your smart device without any restrictions. Users can mirror pictures, music, camera, and documents from phones, tablets, latops, and desktops onto a TV screen or projector. Wireless Connection - Cast your photos, videos, music, documents, and browser from your laptop, desktop, and smartphone. Multi-Platform Support - Compatible with iOS, Android, Windows, and Mac OS. Multi-Device Support - Software to mirror your device using DLNA (Android) and Airplay (iOS/OS X) is EZCast. Please make sure the Android device supports Miracast if you want to mirror screen on to a television or projector. If you have any questions about this product by Hiija, contact us by completing and submitting the form below. If you are looking for a specif part number, please include it with your message.